A square paper is prepared. Make 4 creases,diagonally , horizontaly and vertically as shown in the first picture. This will define 4 middle points. 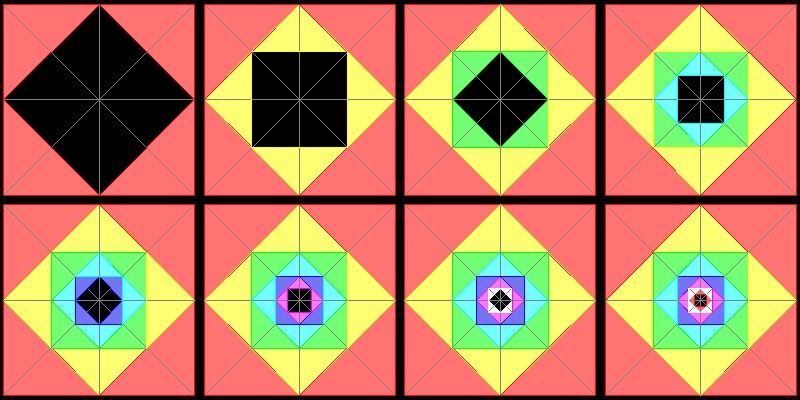 Using these 4 points,fold 4 triangles as shown by red . Area covered by red is (1/2) of the square paper. Apply the same process to the area not colored yet. This will give the second yellow area. 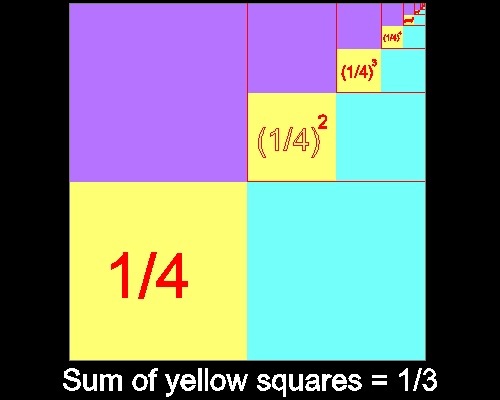 The yellow colored area is (1/2) of (1/2) , which is (1/2)2. If this process repeated infinitely, then the colored area will eventually cover all the paper area. This is equivalent to stating the following. We know in general (when n is not 1)that infinte sum of geometric series of (1/N)k type is 1/(n-1) . then it is possible to demonstrate a similar proof for other values of N.
Infinite sum of geometric series with ratio = 1/4 is 1/3 as shown in the figure below. 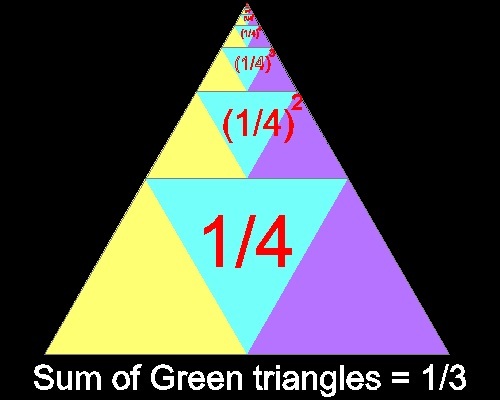 If the area of the triangle is replaced by any arbitray angle, this same idea can be used to do "angle trisection". You can see the process in animation. Row, T.Sundara : Geometric Exercises in Paper Folding. Dover Publishing, p.7-8 ,1966, original in 1905. Nelson,R.B. : Proofs Without Words: Exercises in Visual Thinking. MAA,p.121, 1993. Nelson,R.B. : Proofs Without Words II: More Exercises in Visual Thinking. MAA,p.111, 2000. Copyright 2006 Takaya Iwamoto All rights reserved.